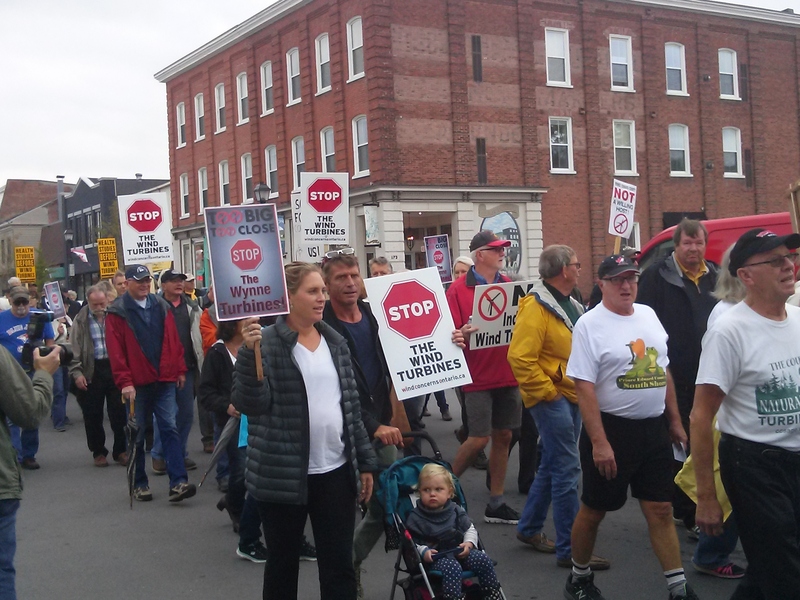 Hundreds of community members in Prince Edward County marched down Picton Main Street yesterday to protest the “White PInes” wind power project, and the Ontario government’s wind power policy. The march was followed by a three-hour information session. The project by Germany-based wpd was trimmed from 29 to 9 turbines in various appeals, but the developer is still proceeding despite questions as to whether it actually has a contract with the Ontario government, and whether the 9-turbine project makes any financial sense. Among the speakers at the information session was Wind Concerns Ontario president Jane Wilson, who reviewed the findings of the organization’s request for documents on reports of excessive wind turbine noise made to the Ministry of the Environment and Climate Change, under the Freedom of Information and Privacy Act. “We wondered, what happens to all the reports being made to the government? Here’s what we learned: The government does nothing,” Wilson said. Other community members spoke on concerns for wildlife, heritage features (the nine turbines will surround the historic Loyalist settlement of Milford), and the effect on citizens’ water wells. While the power developer claimed there would be no problems as a result of sinking huge wind turbine foundations into the ground, which features fragile karst topography, Les Stanfield remarked that there are sinkholes all over the County, and there were concerns about the turbines’ effect on aquifers. MPP Todd Smith said loudly, what no one had said was that the whole push for wind power and the Green Energy Act was “the biggest con job” ever in Ontario.” Obviously, he said, repealing the controversial act is mandatory. Renowned vintner Norman Hardie said the power project “must not go ahead.” Eco-tourism, the County’s economy, and the entire character of the area would be irreparably damaged, he said. Wilson added to her presentation that at the time of the event, wind power was being constrained or held back at record levels in Ontario, according to IESO data for Sunday. “That just adds insult to injury,” she said. Residents last week filed notice of legal action against the Independent Electricity Systems Operator or IESO over the project, which they say has no legal contract. The first court date is November 17 in Picton. Donations accepted at the community group website. I am very proud of everyone of you! Sorry I missed being there. Once again residents being threatened by industrial scale turbines, have to scrape up money for a legal challenge against a government that just will not listen and intervene to protect them! This has been such an expensive fight. People being harmed are the most vulnerable and yet the added expenses this struggle has forced them to incur are a form of punishment in and of itself. At a personal level, this has been devastating financially. Some people have spent every spare hour of every day of the week for years now trying to figure out how to protect their community from this government’s stupidity. When can we resume our normal lives again? Prince Edward County is a shining example of revitalization efforts in Ontario. Collingwood is a favourite destination for day trippers. The Huron County shoreline was being promoted as the ‘West Coast’ of Huron County. These revitalization efforts were/are so admirable. The lack of common sense from this government is utterly profound! Thanks to all who spoke so forcefully this weekend! We simply must make this an historical turning point in the history of rural Ontario. Even urban voters who love to come out to the countryside, are realizing how ridiculous industrial scale turbines are. I was there . . . . it was AMAZING ! ! ! Can anyone, please, help us ? I wish that not to be true! Einstein: The human stupidity and the universe are endless, but I am not so sure about the latter. If the Green Energy Act is cancelled, will that bring relief to the residents who are experiencing harm? Will the turbines that are sited in clusters surrounding people’s homes and bombarding them with noise, low frequency noise modulations and infrasound radiation, which no one in this government is effectively protecting them from, be turned off? Will people forced to leave their homes in order to seek protection from turbines that were sited too close to their homes and have been/still are harming their psychological and physical health, be compensated without having to pay lawyers to defend them in court against the wind companies and this government? Will all agents of this government, who were made aware of harm and who turned a blind eye, be held financially liable for the damage they have caused to residents who were forced against their will to watch this happen to their neighbourhoods and who tried in every way they could think of to get the turbines turned off in order to regain the safety security and pleasure of their homes? Sommer, we are all concerned for our neighbours being harmed and somehow we will find a way to stop this nonsense. The Nacelle bushing and bearing assembly has deformed when the blades were locked for repairs. A flat spot on the rotor causes increased tension on the sidewalls and unwanted vibration which reduces the expected lifespan of the transmission unit. To eliminate this the entire mechanical movement is kept rotating slowly during low wind by outside energy sources. Many people have asked me why and how they keep turning when the wind stops and it is to reduce build-up on the blades causing shedding and to maintained the level of balance throughout the transmission system including the generator/motor.